After eight years of absence, the participation in this fair is part of the strategy of FRESMAK in order to increase its market share in Germany. The company will also be exhibiting at the fair AMB in Stuttgart next September. During the METAV show, FRESMAK exhibited both standard vices as well as special applications and introduced for the first time the new ARNOLD SC70 vice and the brand new product range fresmak BLOCK-SC, self-centering static blocks, in the German market. This time, the influx of visitors was higher than in the past editions and it has been reflected on the number of inquiries about FRESMAK products. 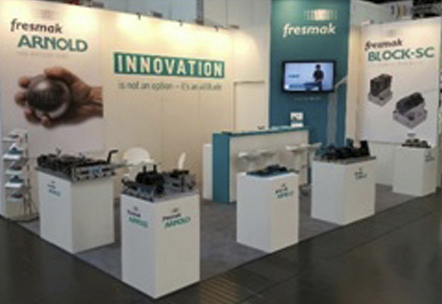 As for the country of origin of visitors, 87% of companies visiting the FRESMAK booth were German. Moreover, several othe companies visited the booth mainly companies coming from Belgium, Holland, Sweden, Austria, Switzerland, Portugal, Russia and Serbia. On the occasion of its participation in METAV, the INDUSTRYARENA platform interviewed Ramon Cenarruzabeitia, General Manager of FRESMAK, during which he explained FRESMAK’s interest in the German market and its strategy.